Basic Principles of Induction Logging provides geoscientists with the information required to survey the electrical conductivity of rocks surrounding a borehole. The formation conductivity distribution in the borehole vicinity is critical information required in formation evaluation and geosteering applications. Developing a theory of EM logging and on understanding basic physics for both wireline and LWD logging tools, this reference furnishes valuable insights for development and use of EM techniques in practical logging applications. 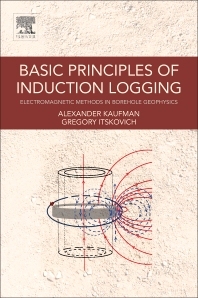 Basic Principles of Induction Logging will be vital for anyone attempting to investigate, invent, and develop the next generation of EM logging tools. It will provide information required to enable operation in more challenging environments such as logging while drilling, anisotropic and thinly laminated formations, high angle and horizontal wells. Dr. Itskovich is a Technical Advisor with Baker Hughes who has been employed since 1994. He received his Ph.D. degree in geophysics from the Russian Academy of Science, and an M.S. in electro-physics from Novosibirsk Technical University. Gregory’s research interests and experience include advanced EM measurements, mathematical modeling and inversion of well-logging resistivity and NMR data. He has published 40 professional papers and holds more than 50 U.S. patents, and is the inventor of several geophysical instruments that have been commercialized on a worldwide basis.